A Glock would have taken that silt, laughed and spit it out like it was nothing. 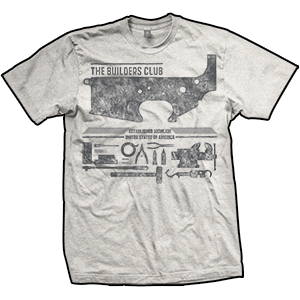 FXhummel is wearing the new Oatmeal colored AR-15 Builders Club t-shirt from ENDO Apparel. Thoughts? Did FX get what he deserved with that Sig? Don’t think a Glock would have fared much better. A barrel obstruction is a barrel obstruction no matter how wide your tolerances are elsewhere. He broke his Glock too…he lost his takedown /slide stop bar… what??? It was sad they had to cut the barrel on the Sig but not much else you can do when you get a bulge in the barrel. Is he becoming a tactical operator now that he shot by photographers at Yeager’s school? Really the worst luck with guns. Glocks, sigs, ak’s, 870’s, and springfield armory don’t stand a chance with FX. The fame has gone too his head. Hes so rich with youtube money he can trash sigs like they are high points, who cares, hes special. Pretty soon he will be doing psa’s, then there will be a britneyesque meltdown and finaly a behind the music special showing his decline into wife beating, ‘roid abuse, (that he found in yeagers basement) and being turned down as the opener for Adam West ant cat shows. Its all over for him now, unsub if you dont want to watch the trainwreck.